There were Irish in Sangamon County before there was Sangamon County. When county commissioners had to choose a temporary county seat in 1821, the only practical location was a scattering of squatter cabins near what today is First and Jefferson streets in Springfield. The squatters were the families and relatives of brothers John, Elisha, William and George Kelley and their father Henry, who moved from North Carolina to the Sangamo Country in the late 1810s and early 1820s. Their ancestors arrived in America sometime before 1710. Exactly where they departed Europe is unknown, but the family almost surely originated in Ireland, where Kelly/Kelley today is that nation’s second most common surname. Aside from the Kelleys, it took another 25 years – until the Irish potato famine of the 1840s – for people of Irish descent to become a substantial portion of Sangamon County’s population. In 1840, one of Springfield’s earliest Catholic priests, the Rev. George Hamilton, explained in a letter to the Roman Catholic bishop of St. Louis, Giuseppe Rosati, why he hadn’t been able to have a church built in Springfield. I have come to the conclusion that it is useless for me to try to build a church with the means I at the present can command. The Catholics are … too few and too poor to build one themselves and their numbers do not appear to augment. In these circumstances, Sir, I confess I am at a loss to know how to proceed. That changed quickly when refugees of the potato famine started flooding into the U.S. and into Springfield. Purdue University doctoral candidate Christopher Wallace studied the numbers in his 1983 thesis, The Opportunity to Grow: Springfield, Illinois in the 1850s. As of the 1850 U.S. Census, Wallace found, Springfield had 61 Irish households, more than 8 percent of all households in the city; that made the Irish Springfield’s most populous immigrant group. 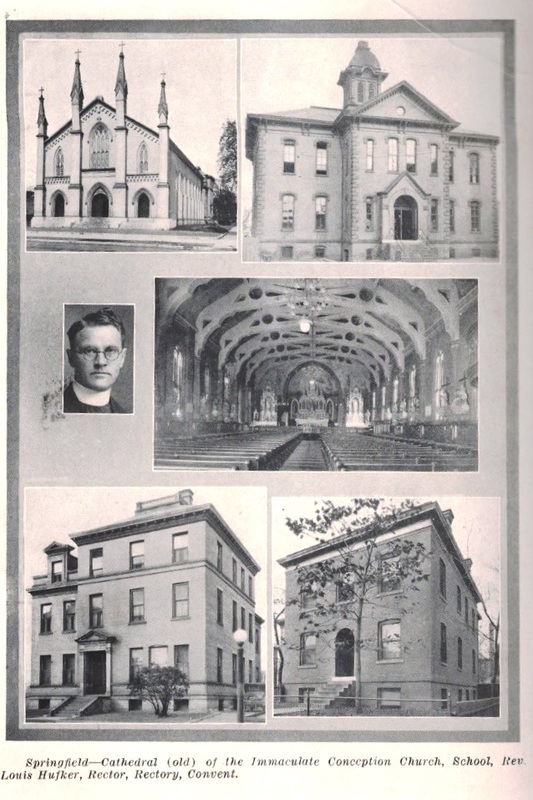 The Church of the Immaculate Conception, along with its school, convent and rectory, were shown in the 1928 Diamond Jubilee History of the Catholic Diocese of Springfield, compiled by Joseph Thompson. The influx continued. The 1860 Census found 353 Irish households in Springfield, suggesting that, by then, one-fifth of all city residents were Irish. Among other consequences, that allowed Hamilton’s successor priests to build churches – the first, St. John the Baptist Church, was built in 1848 on the south side of Adams Street between Eighth and Ninth streets; it was replaced in 1858 by the Church of the Immaculate Conception on the northeast corner of Seventh and Monroe streets. 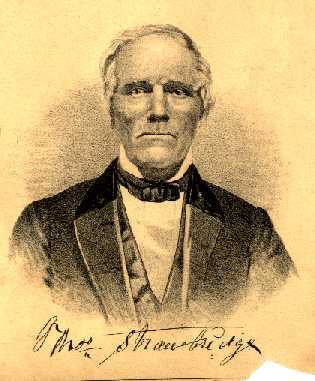 Economically, Springfield’s Irish newcomers were largely unskilled and cash-poor (earlier Irish settlers, like Thomas Strawbridge Jr. – see photo above – tended to be better off). But Wallace and another researcher, Jane Knepler – author of Up and Out of the East End: The Irish in Springfield, published in the July 1976 Bulletin of the Illinois Geographical Society – found that opportunity in central Illinois was still far better than in impoverished Ireland. Wallace determined that, already in 1850, nearly half of Springfield’s immigrant Irish owned property (presumably their homes in most cases). That proportion was roughly comparable to the real-estate holdings of both immigrants from other countries and native-born residents, although Irish-owned property (both real estate and personal property) tended to be worth much less than that of non-immigrants. (And) occupational distribution differed markedly; the Irish were more often unskilled workers and less often skilled workers than the native born in 1850. Nevertheless, there were ten Irish skilled workers among the sixty-one Irish household heads in addition to five proprietors and five professionals. There were several Irish success stories among the 1850 heads of household. The wealthiest ($18,000 in reported real property) Irish resident in 1850 was David Spear, a prospering merchant. Spear had been in Springfield at least since 1833, when the Sangamo Journal announced the opening of his dry-goods store. Other successful Irish immigrants as of the 1850 U.S. Census included merchants John and Thomas Condell; both were born in Ireland and came to Springfield in 1841. And the two local hotels with the most guests when the Census was taken were both owned by Irish immigrants. An analysis of the original census enumeration data for 1880 shows that there were 4,122 first and second generation Irish living in the city of Springfield (one-fifth of the city’s population). They were found making their livelihood in diverse ways, and they were living in varied circumstances. About four hundred men worked as common laborers, over eighty were coal-miners, and forty-five were employed by the railroads. One of the miners was a “topman” who headed the largest Irish family in Springfield, a family of fourteen. Two of his daughters were employed as seamstresses and one clerked in a store. The typical family had from five to seven children. In Ireland, couples usually married after the age of thirty and many almost immediately emigrated. Frequently, the wife was younger by about five years than the husband. At Immaculate Conception Church were Father Bourk (Rev. P.M. Burke – ed. ), Father (Patrick) Brady, and Sister Mary Mela – all natives of Ireland. The principal of Betty Stuart School was Irish. P.J. Rourk of 1215 E. Jackson Street was County Superintendent of Schools and Mr. (Andrew) Brooks was City Superintendent of Schools. They were also natives of Ireland. The engineer and another worker at the State House were Irish as well as the city weigher and the jailer. Mr. Cook, aged twenty, was the city lamplighter. In 1869, a professional fire department was instituted. In 1880, ten of the firemen were Irish. They received only one day a month to spend at home. Springfield also had its Irish policemen – seven of them. The telegraph office had four Irish operators and a sixteen year old messenger boy. One worker in the telephone office was Irish as were two street car drivers, two street car conductors, and two watchmen. Not that everything was rosy. 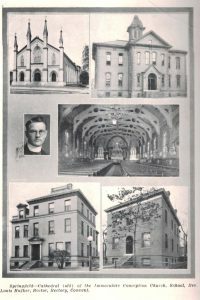 Knepler found that people of Irish descent were disproportionately represented among patients at St. John’s Hospital, and 17 of the 53 local jail inmates – almost one-third – were Irish. Yet, the newly arrived Irish immigrants may well have viewed themselves primarily as people who were fleeing very hard times. From the perspective of an immigrant who left starvation and utter poverty, enough food and a roof overhead may have seemed to be a tremendous improvement. Life as an unskilled laborer at work in building construction may have seemed far better than life as a displaced tenant. There were no reports of starvation in Springfield and only scattered reports of pauperism. … Perhaps it was only later, after memories of the suffering in Ireland began to fade, that the Irish started to compare themselves to the other townspeople instead of the torments they had left behind. Notes: Rev. George Hamilton’s letter is reproduced in the Diamond Jubilee History of the Catholic Diocese of Springfield, 1928. The Sangamon Valley Collection at Lincoln Library has copies of the research papers compiled by Christopher Wallace and Jane Knepler. This entry was posted in Early residents, Irish. Bookmark the permalink. Nice work on the story of the Irish! I think I read somewhere that Irish women became the school teachers, complete with their Irish accents, of the children of successive generations of immigrants.